With the world’s attention focused on Ebola — and rightly so — a common fungus is sweeping through our neighborhoods and befalling our jack-o’-lanterns. And Halloween is over two weeks away! 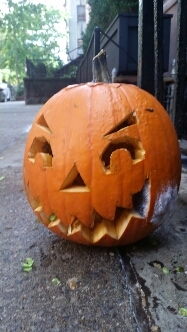 We’ve got moldy pumpkins on the streets of the Upper West Side — do you? These proud symbols of trick-or-treat are being eaten away before the kids have donned their costumes… collected their candy… or tossed their first cookie. 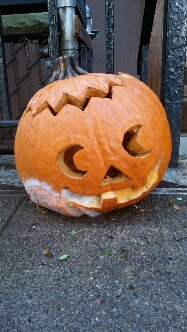 This entry was posted in Children, Design, Family, Holiday, Humor, Life and tagged candy, children, cookie, costume, ebola, fungus, gholish, Halloween, Holiday, Humor, jack-o-lantern, life, mold, moldy pumpkins, pumpkin, something's rotten, symbol, trick or treat, Upper West Side. Bookmark the permalink.